RYANAIR AVIATIONS MOST EXPLOITED AIRLINE WORKFORCE .We are in no way affiliated with Ryanair. : CHEMTRAIL.COULD THEY BE DEADLY CHEMICAL TRAILS BY RYANAIR ...1500 FLIGHTS A DAY.42,000 FLIGHT A MONTH. 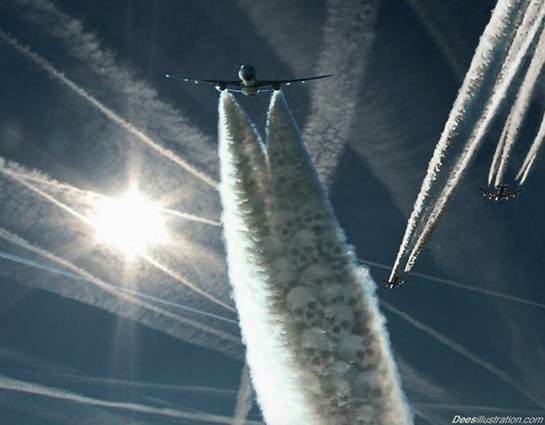 504,000 FLIGHT A YEAR ...HOW MANY SPRAY CHEMICALS ???? CHEMTRAIL.COULD THEY BE DEADLY CHEMICAL TRAILS BY RYANAIR ...1500 FLIGHTS A DAY.42,000 FLIGHT A MONTH. 504,000 FLIGHT A YEAR ...HOW MANY SPRAY CHEMICALS ???? Ryanairdontcare Campaign have been contacted by an organisation in the U.S which is gaining worldwide support.The issue relates to what could be a crime on a large scale on the HUMAN RACE. As we are aware RYANAIR who are not only Europe's Biggest Exploiter of Young People wishing to become cabin crew but also Europe's largest airline that could be involved in this spraying of chemicals. As may be the case airlines have no option but to agree to governments to spray these chemicals in our sky's. We must also like to point out that Ryanair say they deliver 1500 flights each day around Europe and how many of these flights are spraying chemicals and i would give it a LARGE BET,Ryanair will be paid for this at some point..
''The more flights at Ryanair involved in chemtrails could these lead to more profit for Ryanair' and the reason for the 25 minute turn around...'.??????? It may just be a coincidence but within minutes of posting this info Google were tracked on this Blog. Is this real.how can they do this.